Tungsten gaskets surrounding hydrogen in diamond anvil cells were observed to react with hydrogen under pressure to form WHn compounds. EFree Parnters from Cornell and Carnegie employed density functional theory to map out possible stable structures with different n-values (n=1-6 and 8) followed by additional experiments to validate results of the calculations. No hydride is stable at ambient pressure. However, with increasing pressure, energy minimization from theoretical modeling lead to increasingly stable WHn structures with increasing pressure with the value of n also increasing with pressure. 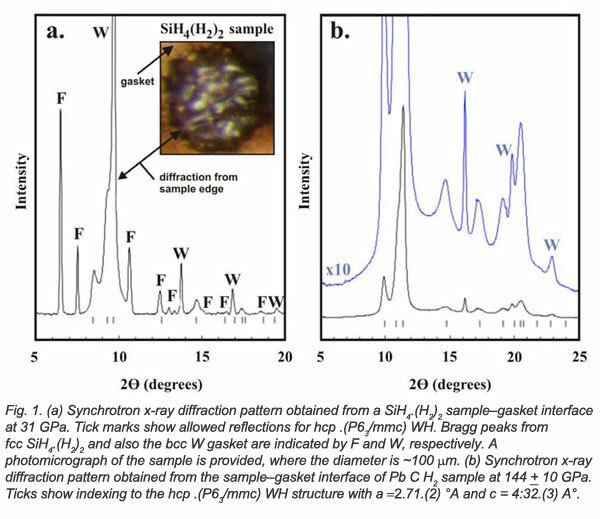 These values reflect increasing coordination number of H atoms surrounding the tungsten atom. Experiments using a laser-heated diamond anvil cell (T ≤ 1000 K) yielded only WH. X-ray patters of higher hydrides could not be indexed. Various reasons for the difference between results of theoretical modeling and high-pressure experiments were offered. The authors refrained from conclusions regarding these differences. It is postulated that a pressure increase is likely to stabilize tungsten hydrides, and that “whatever pressure is chosen in the range studied, WH certainly appears as a very stable hydride.” Furthermore, as hydrogen continues to be present, it is expected to react with WH in an exothermic reaction to form higher hydrides [P. Zaleski-Ejgierd, et al., J. Phys. Condens. Matter. 24, 155701 (2012)].